Author and award-winning scholar-professor Fred Kleiner continues to set the standard for art history textbooks, combining impeccable and authoritative scholarship with an engaging approach that discusses the most significant artworks and monuments in their full historical and cultural contexts. GARDNER’S ART THROUGH THE AGES: THE WESTERN PERSPECTIVE, VOLUME II includes nearly 100 new images, new pedagogical box features, images that have been upgraded for clarity and color-fidelity, revised and improved maps and architectural reconstructions, and more. Over 40 reviewers — both generalists and specialists — contributed to the accuracy and readability of this edition. A unique scale feature will help students better visualize the actual size of the artworks shown in the book. Within each chapter, the “”Framing the Era”” overviews, timeline, extended captions, and the chapter summary section titled “”The Big Picture”” will help students review for exams. Purchase Gardner’s Art through the Ages: The Western Perspective, Volume II at Discounted Prices ✓ FREE DELIVERY possible on eligible purchases. Author and award-winning scholar-professor Fred Kleiner continues to set the standard for art history textbooks, combining impeccable and authoritative scholarship with an engaging approach that discusses the most significant artworks and monuments in their full historical and cultural contexts. 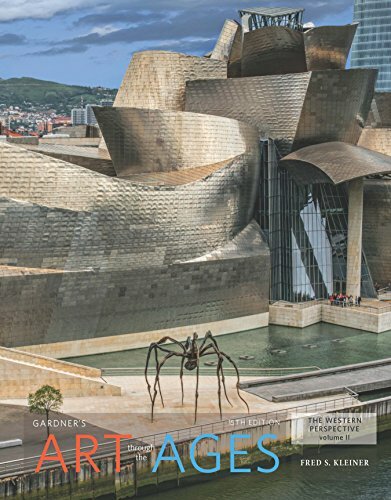 GARDNER'S ART THROUGH THE AGES: THE WESTERN PERSPECTIVE, VOLUME II includes nearly 100 new images, new pedagogical box features, images that have been upgraded for clarity and color-fidelity, revised and improved maps and architectural reconstructions, and more. Over 40 reviewers -- both generalists and specialists -- contributed to the accuracy and readability of this edition. A unique scale feature will help students better visualize the actual size of the artworks shown in the book. Within each chapter, the ""Framing the Era"" overviews, timeline, extended captions, and the chapter summary section titled ""The Big Picture"" will help students review for exams.